The County Council has one speaker and one deputy speaker. After inauguration of the entire body of Council members, they shall be elected among the Council members through a mutual and open voting. The speaker shall comprehensively manage the Council affairs. In case that he or she cannot execute his or her duties for any reason, the deputy speaker shall act on behalf of the speaker. When a Council meeting is held, the speaker shall chair the meeting. 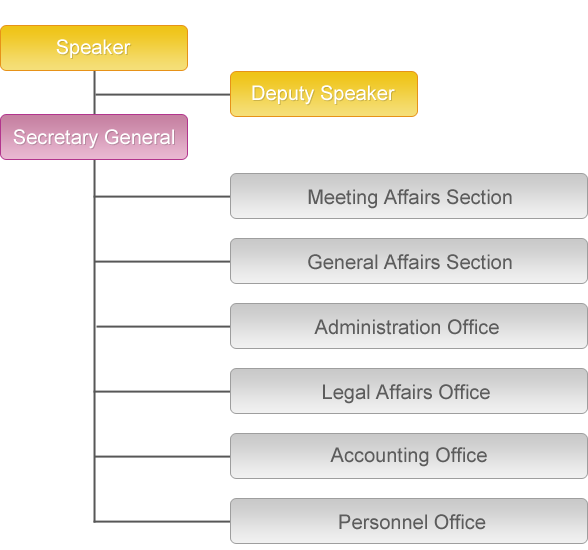 In case that the speaker cannot attend the meeting, the deputy speaker shall act on his or her behalf to chair the meeting. If the speaker and deputy speaker all cannot be present at the meeting, the meeting chair person shall be elected by the Council members among themselves. The Council members shall be elected by the county’s voters. The number of the seats for the Council members shall be calculated in accordance with Article 33 of the Local Government Act and Article 3 of the Council Organization Self-Governance Statute, in which the county is divided into 13 election zone, and a total of 36 Council members shall be elected as the Council’s 19th –term Council members.